When esters are treated with strong base, an enolate can be formed. By the attack of an ester enolate on a carbonyl group generates a new carbon-carbon bond—β-keto ester. The Claisen condensation is the general reaction of enolates with other carbonyl compounds. In the Claisen condensation, two molecules of an ester undergo addition-elimination reactions and they react with each other in the presence of an alkoxide base. This is simply a nucleophilic acyl substitution reaction in which the nucleophile is an ester enolate and the electrophile is an ester. The product of this reaction is a β-keto ester. To prevent transesterification, both the alkoxide and the ester are usually derived from the same alcohol. The mechanism of Claisen condensation begins with the formation of the ester enolate ion. The ester is first deprotonated in the α position to form a resonance-stabilized enolate. Then this enolate function as a nucleophile and attacks another molecule of the ester, forming a tetrahedral intermediate. In the next step, the tetrahedral intermediate expels the leaving group to re-form a carbon-oxygen double bond. These addition-elimination steps are reversible and the overall process is endothermic through this stage. The last step in the mechanism is deprotonation of the β-keto ester to give a doubly stabilized enolate. 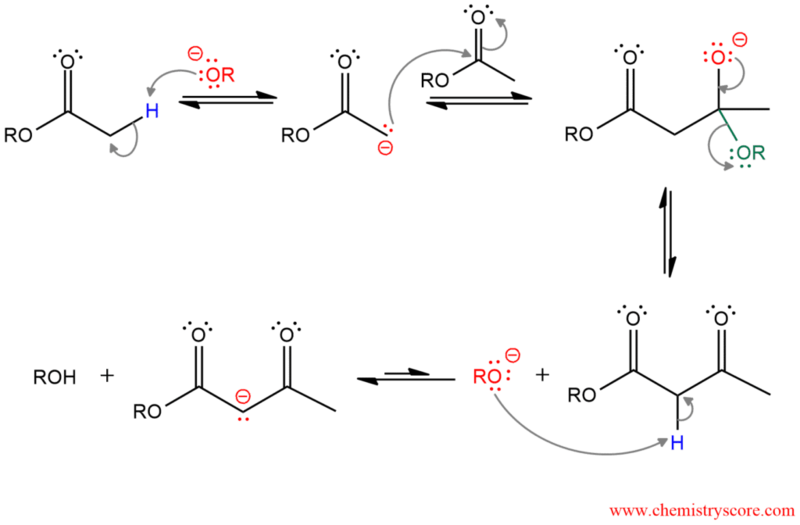 This deprotonation step cannot be avoided because the reaction occurs under basic conditions. After the reaction is complete, work-up with aqueous acid restores the proton to the central carbon atom of the doubly stabilized enolate, furnishing the final product (β-keto ester) and completing the process.